The world is flat again, according to Rei Kawakubo. Or at the very least, the clothes are. 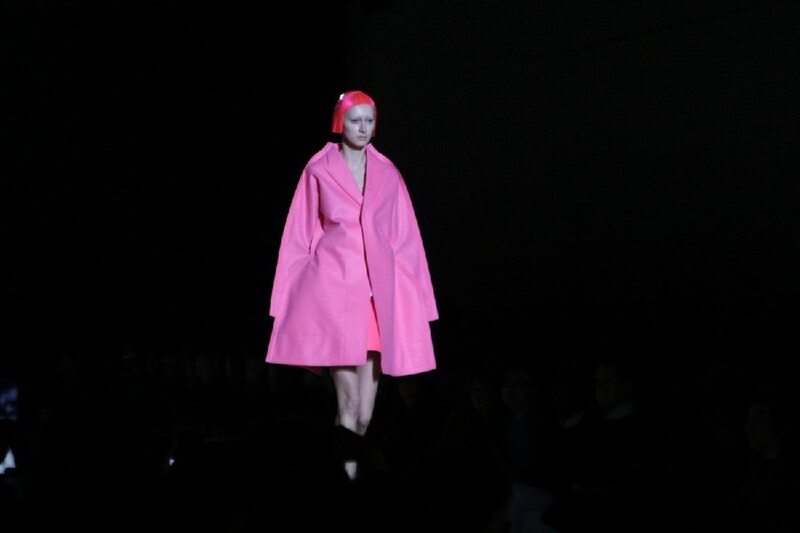 That was the big idea at the latest Comme des Garçons show and quite literally, everything was BIG. To an ear thudding silence of just the photographer’s pit snapping away and nothing else, oversized proportions of giant coats, jackets and trousers in the brightest shades of red, pink and lilac wool felt came trooping out with seam allowances jutting out at the sides. The curves to these garments were magnificent to behold and didn’t feel like they were dwarfing the models because there were controlled by the natural stiffness of the felt. When enlarged patterns of leopard, naïve flower drawings and polka dots and camouflage started to appear, it was clear that Kawakubo was asking questions about our 21st century fascination with gleaning every detail up close and personal in fashion. The ubiquity of live streams, instant images, close-ups, behind the scenes – all revealed and offered up to the wider audience – is reinterpreted by Kawakubo's thorough investigation of the 2D surface of. And yet, as flat fronted as these pieces looked, it’s when the models turn around that you see constructions that actually celebrated the curve and the 3D in an almost simplistic way, like a child moulding Play-Doh into something. A front-on picture of these pieces don’t do them full justice but perhaps Kawakubo is fine with people remembering the mere flat surface and nothing else. Things got playful when a print of a dress shape in electric pink was imposed on a blue oversized dress. It’s a simple expression of trompe l’oeil, aided by saturated shades of colour that have been largely absent this season. Kawakubo then took us to more childish memories with a series of chintzy rose floral cocoons and sequined ball gowns, hinting at curvature rather than flatness. Reading deep into that contradiction won’t do you any good though so it may be best just to soak up the appearance of it all and revel in it, as the audience did when they applauded the collection endlessly, thumping their feet, waiting for Kawakubo to emerge. She of course, didn’t.